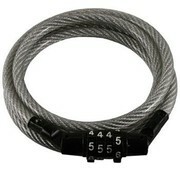 The Kryptonite Keeper 712 Combo Cable is an excellent locking option for quick release components and accessories. Comes with a preset 4-digit combination. The 5 mm self-coiling flexible steel cable is housed in a clear, protective vinyl cover. The combo cable lock weighs 0.45 pounds. Perfect for securing quick release components and accessories.